My Guitar Has Sharp Frets. Should I File Them? 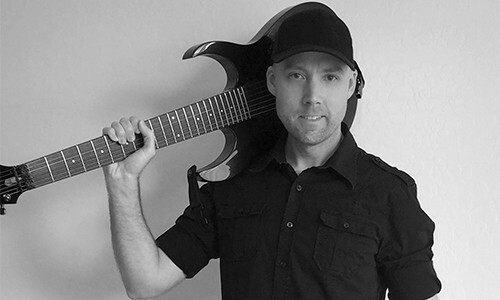 https://www.guitaranswerguy.com/wp-content/uploads/2016/12/feat_sharp_frets.jpg 290 833 Guitar Answer Guy http://www.guitaranswerguy.com/wp-content/uploads/2015/11/logo_170x125.png Guitar Answer Guy2016-12-22 03:00:272019-03-21 16:28:22My Guitar Has Sharp Frets. Should I File Them? Reader Question: Should I Loosen Guitar Strings Before Shipping? 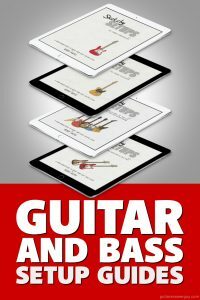 https://www.guitaranswerguy.com/wp-content/uploads/2016/08/feat_loosen_before_shipping2.jpg 290 833 Guitar Answer Guy http://www.guitaranswerguy.com/wp-content/uploads/2015/11/logo_170x125.png Guitar Answer Guy2016-08-31 02:00:372019-03-21 16:32:32Reader Question: Should I Loosen Guitar Strings Before Shipping? The Great Lemon Oil Debate. Is Lemon Oil Safe for Guitar Fretboards? https://www.guitaranswerguy.com/wp-content/uploads/2016/06/feat_lemon_oil.jpg 290 833 Guitar Answer Guy http://www.guitaranswerguy.com/wp-content/uploads/2015/11/logo_170x125.png Guitar Answer Guy2016-06-29 03:00:422019-04-10 06:50:21The Great Lemon Oil Debate. Is Lemon Oil Safe for Guitar Fretboards? Hey, we love our guitars, right? We want to take care of them so they continue to give us a lifetime of joy and self-expression. However, when it comes to guitar care and our efforts to pamper our axes, it’s possible to overdo it–using too much stuff too often, or even using substances that are actually harmful to the guitar. Let’s review some of the guitar care mistakes I’ve seen (and made) over the years, as well as some of the crap you should never use on your guitar. At some point I’m sure you’ve heard that your guitar’s fretboard should be oiled. 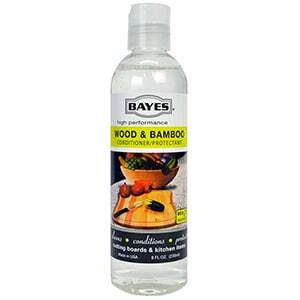 If your guitar has an unfinished (non glossy) rosewood or ebony fretboard, it’s true that it may benefit from an occasional application of a fretboard-safe oil. However, it should only be done about once a year (or less), and then only if it really seems to be dry or you’ve somehow stripped it of moisture, such as when you do a deep cleaning like the one I demonstrate in this blog post on fretboard cleaning. To give you an idea: I oil my fretboards only about 2-3 times in a 5-year time span. Using too much oil and/or oiling too often can eventually lead to maintenance issues or even damage. I’ve seen or heard of frets, binding, or inlays coming loose in extreme cases. You don’t need to drown the fretboard–just a light application is all that’s necessary to bring some of the rich color back to the wood. 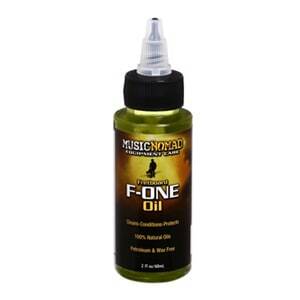 Also, if you’re going to oil your fretboard use the right kind of oil, and then only use a tiny bit. Wipe it on, let it set for about a minute, then wipe ALL the excess off the wood with an absorbent cloth or paper towel. Hey, it knocked out those squeaky door hinges and made your bike wheels spin forever, so it must be great for the moving parts of your guitar too, right? For brevity, I won’t go into detail on the issues with WD-40, but it’s best for beginners to just keep it away. Leave WD-40 to the pro’s who know what they’re doing and how (and where) to use this correctly when they’re working on guitars. I was appalled recently to discover a how-to article on the Internet where the author gives an in-depth demonstration (and endorsement) of how he uses WD-40 to clean his guitar strings. Don’t do this. 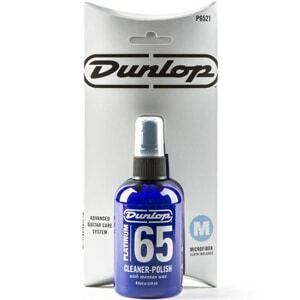 It actually will clean your strings quite nicely, and will make them feel nice and slick. The problem is what happens as your fingers transfer any leftover residue onto the fretboard, neck, and finish as you play. 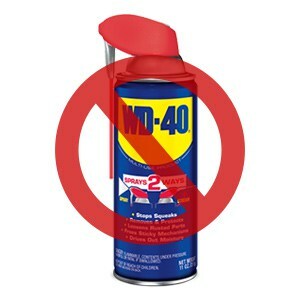 You may think you were careful and wiped off all excess WD-40, but why take that risk? 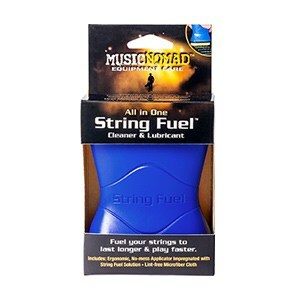 If you’re wanting to clean your guitar strings to squeeze a little more life out of them, then at least use a proven, guitar-safe string cleaner like Music Nomad String Fuel Cleaner & Lubricant or GHS Fast Fret. 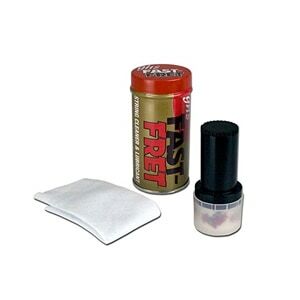 I used GHS Fast Fret for many, many years (it lasted for freaking ever) until I discovered the Music Nomad products (which I love, if you couldn’t tell). You can also just wipe your strings with a dry cloth every time you finish playing/practicing as I demonstrate in this blog post. Or, if your strings are old, just replace them. 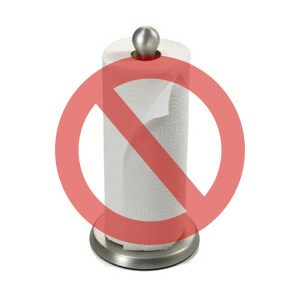 BAD: Using Household Paper Towels, T-shirts, Socks, Shop Towels, Etc. Regular ole paper towels, like those you buy at the grocery story, are okay for wiping your strings and the bare wood of the fretboard, but never use them on any of the glossy parts of your guitar. They’re just not soft enough and can leave tiny scratches in the finish. I don’t exactly know why, but whatever they put in these paper towels just isn’t soft enough for most guitar finishes. Also, to be safe, avoid using t-shirts, socks, washcloths, shop towels, etc. on glossy bits, even if they’re 100% cotton. When it comes to the glossy finish of your guitar, I’d recommend only using microfiber towels. 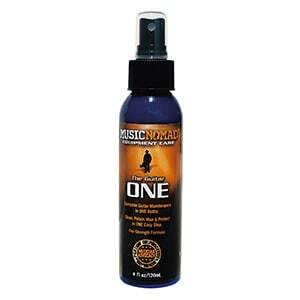 I’ve been using a Music Nomad Microfiber Guitar Polishing Cloth for all my cleaning and polishing. I use that one because not all microfiber towels are created equal, and with the Music Nomad cloth was manufactured it FOR guitars. Another great cloth to use for cleaning glossy guitar finishes (and everything else, for that matter) is a cotton cloth baby diaper. That’s right, for years I’ve been using Gerber Birdseye 3-Ply baby diapers for cleaning everything from metal parts to the fretboard to the glossy finish. I love those things! Just be sure you wash and dry it 3-4 times before you use it. That’ll help soften it up even more. Don’t use fabric softener when washing them. I sometimes see people bragging on guitar forums, “I’ve used Lemon Pledge on my guitar for years, with no problems!” My question to these people is always the same: How many “years” are we talking here? Get back to me after you’ve used Lemon Pledge on the same guitar consistently for about 15 – 20 years and let me know how that worked out for you. Here’s the deal: It depends on what your guitar’s finish is. If I ask you what your guitar’s finish is and you have to think about it or look it up, just stay away from furniture polish. Otherwise, you’re playing Russian roulette with your axe. First off, avoid any kind of polish or cleaner if your guitar has a “satin” (non glossy) finish, or feels like it’s just natural wood (these are usually finished in some kind of oil or oil/lacquer mixture). Really, the safest way to clean a satin finish is with a cotton cloth slightly damp with warm water, followed by a dry cloth to remove any leftover dampness. If your guitar has a “natural” wood finish, I’d recommend consulting a pro first and asking them what you should do. Nothing you see on the shelves at a grocery (or similar) store should be used on your guitar. 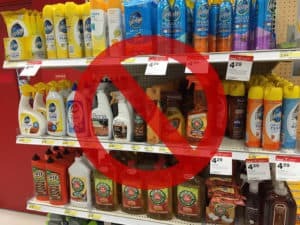 To some it may seem obvious, but I’m just going to come right out and say it anyway: do not use household cleaners such as bleach, Pine Sol, Windex, Fantastic, etc. on any part of your guitar, unless it’s a total junker you really don’t care about. 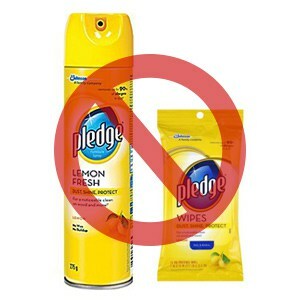 You’ll be especially tempted as you pass by the furniture & wood cleaning section (this is where you’ll find the lemon Pledge) in your grocery store. Don’t be swayed by all the marketing lingo about how these products “nourish wood”, “safely clean wood”, “condition and protect wood”, etc. Just keep on walking. 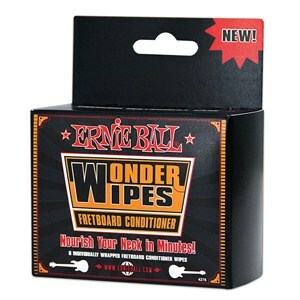 The fact that these products work great on wood furniture and floors does NOT mean they’ll be good for your guitar. I’ve given you some great, guitar-safe alternatives to consider in this article. However, all the fancy guitar cleaners and polishes on the market today have created somewhat of an over-inflated perception of how necessary they actually are. Don’t get me wrong, I love the products that I use and have recommend here, but the reality is that good ole warm water, a soft cloth, and some elbow grease can work wonders on a dirty guitar. Just be careful that the rag isn’t soaking wet. You only want it slightly damp with water. For tougher grime in small areas, you can do exactly what mom did to you as a kid: wipe the spot with a dab of saliva. NEVER spit on someone else’s guitar, but when it comes to your own axe, don’t be afraid to daub a little spit on a rag to rub off the tougher gunk. I play my guitar almost every day. Do I need to keep the strings loose or is it alright to keep the guitar tuned up? Keep your guitar tuned up to pitch, especially if you play it regularly. There’s really no reason to detune a guitar that you play regularly and, in fact, it would be pretty inconvenient if you had to completely retune it every time you wanted to pick it up and play. Guitars were designed and built with string tension in mind, so you can safely keep them tuned up to pitch, even if you’re not going to play them for a month or two. If you have a steel-string acoustic or electric guitar, there is a metal rod inside the neck called a “truss rod.” It’s adjustable, and its job is to counteract the tension of the steel strings. It bends the neck backwards against the string pressure, and the net effect is a neck that stays relatively straight and stable. So, you can keep your steel-string acoustic or electric guitar tuned up to pitch and not play it for months or even years without having to worry too much about damaging the neck. Some guitars even have additional metal or carbon fiber rods inside to provide extra stability. Your bigger concerns should be temperature and humidity (read my in-depth article on humidity here). If your guitar has a truss rod rod, it can be adjusted via a bolt that is located just inside the soundhole (on acoustics) or under a cover on the headstock (on electrics). Now, Classical or nylon-string guitars are a different story. If you’re not going to play a Classical guitar for a long period of time (say, more than a few months), then loosening the strings may be a good precaution because Classical guitars usually do NOT have a truss rod inside the neck. The reason is because, under normal playing conditions, nylon strings simply don’t pull on the neck hard enough to warrant one. However, if left unplayed for many months while tuned up to full pitch, and the neck can indeed take a forward “set” (the neck becomes permanently bowed forward). Some of the more modern Classical guitars may have carbon fiber or similar reinforcement rods in the neck. Check your model’s specs and if this is the case, you can safely leave your Classical guitar tuned to pitch at all times.